Unlike Pal Park though, the method of obtaining them here is a simple minigame. 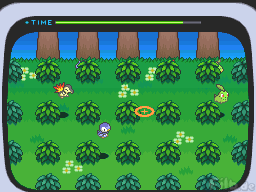 On the top screen, you will see various bushes and the six Pokémon will jump between various ones. Your task here is to use a Bow which shoots out Pokéballs to try and capture them. This is controlled with the touch screen and requires good aiming. There is a reticule on the topscreen so you can see where the ball is likely to land. There is also a time limit to the capture here. The rarer Pokémon tend to move faster. As time progresses, a pink cloud will appear which will make all Pokémon fall asleep for a short time so you can capture them. The Pokémon you fail to capture during this minigame will return back to the game you're transferring from and can be transferred again. 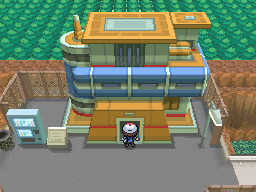 Also, unlike Pal Park, you can transfer Pokémon at any time with no limits. As soon as you have transferred your six Pokémon and completed the mini-game, you will be asked if you wish to transfer more. This can be done straight away and any number of times so you can get your Pokémon across easily. As you fill up your boxes, your box limit will increase until it hits 24 boxes.